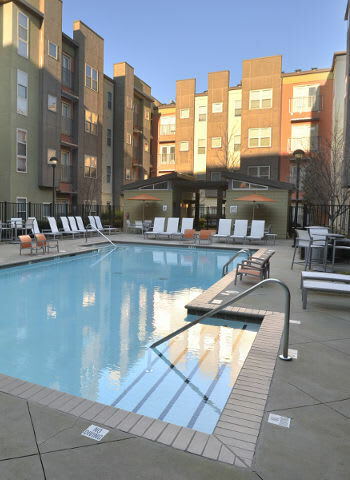 At The Flats we offer students in Atlanta, Georgia all the amenities they could possibly need and even a few they never knew they wanted. Our fully furnished two, three, & four bedroom apartments offer students of Georgia Tech, Georgia State, SCAD, Spelman, Morehouse and Clark Atlanta Universities contemporary midrise living in the comfortable neighborhood of Atlantic Station. We offer many of the amenities found most desirable by college students. For starters, it is time to say goodbye to the local laundromat, because each of our apartments comes stocked with a full-size washer and dryer. Worried about sharing a bathroom with your roomies? Don’t be. There is an in-suite full bath for every bedroom. To top it all off, we treat you right with upgraded WiFi. Our community amenities are equally outstanding. At The Flats, we invite you to come socialize in our clubhouse with a game of billiards or relax by our resort-style swimming pool. Can’t make it to the student rec center for your daily workout? Our 24-hour fitness center is here to help you get your sweat on! We even offer free gated parking. Do you need to see it to believe it? Peek in on The Flats photo gallery for more information.